You may already have a website whose purpose is to present you and your services to the world, and if so you might wonder how best to “integrate” that website with CoachAccountable. It turns out that CA is itself designed to be a complete experience for your clients, so integrating it with your regular website is often as simple as making it easy for your site visitors to log into the CoachAccountable accounts they have with you. A common way to integrate CoachAccountable with your coaching site or member portal is to make a link from your site to CoachAccountable’s login page (https://www.coachaccountable.com/login). They can click the button or text, log in as usual, and will be taken right to the system. 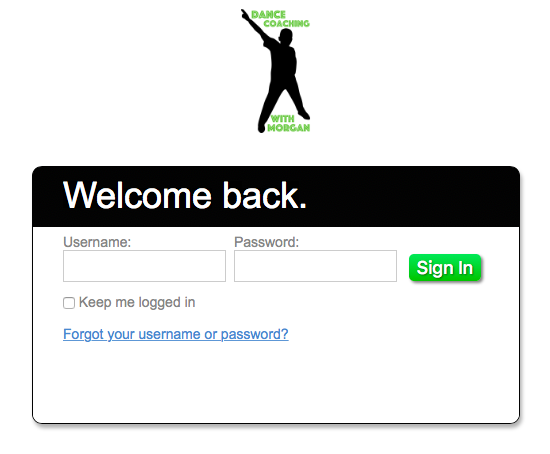 You can direct your clients to check the “Keep me logged in” checkbox when they log in. If they do so, clicking that big button in the future (from the same device) will have them be taken right from your site and on into their account, making for a truly seamless transition. With white-labeling, this concept is taken further as the login page itself can be customized using your branding. 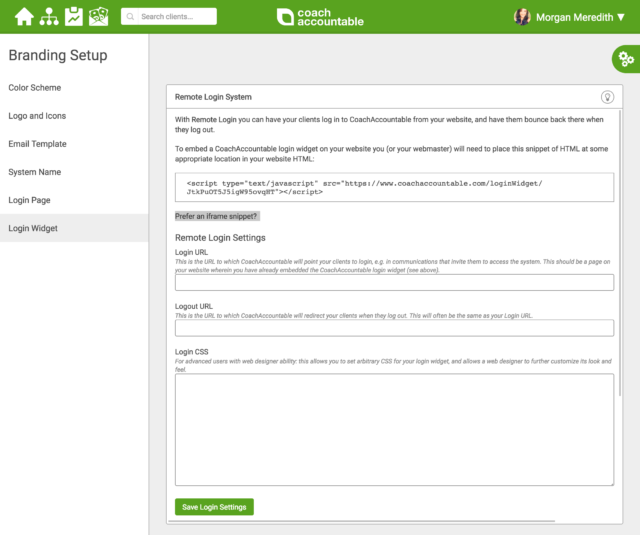 White-labeling allows you to direct visitors to a custom login page using a unique login link, found by going to Settings >> System >> Branding, then scrolling down to Login Page. This custom login page always appears branded according to your settings. Use this simple but effective method to unite CA with your website, and give your clients a straightforward means to access their accounts. Relatively basic, but can be customized with your CSS. Head to Settings >> System >> Branding, and select Login Widget. Here you’ll find the HTML snippet you’ll place somewhere on your website. This section also allows you to define the logout URL, where clients get taken after they log-out, the text that appears on the widget, and any custom CSS you would like to style the widget with. Due to the ability to match the style of the widget to that of your website, Remote Login is a truly consistent method of integrating your two systems. One of our favorite ways to integrate our coaching software into your website is to allow prospective clients to sign up. You can have them book a trial appointment, automatically receive your onboarding items, join a Group or a Course, and more, using Offerings. A simple login link, the login widget, and Offerings represent three easy ways of integrating your site with the CoachAccountable coaching management system. Give these a try today: whether you’re just signing up or have been a CA lifer, there’s a good chance you’ll find one of these approaches is all that’s needed to integrate CoachAccountable with your website. © 2016, JPL Consulting LLC. All Rights Reserved.